Today, millions of Americans say they practice some form of yoga and/or meditation. It’s become a health fad. Yet the goal of these practices seems unknown or elusive to many practitioners — transcendence. An article: Transcendental experiences during meditation practice, by Fred Travis, PhD, Director of the Center for Brain, Consciousness, and Cognition at Maharishi University of Management, provides an overview of research on individuals experiencing higher states of consciousness. It is published today in Annals of the New York Academy of Sciences: January 2014, Volume 1307, Advances in Meditation Research: Neuroscience and Clinical Applications, pages 1-8. The paper is based on a presentation Dr. Travis was invited to give at “Advances in Meditation Research” (AMR), a meeting of the nation’s top meditation researchers, which took place a year ago at the New York Academy of Sciences New York City. In his paper Dr. Travis explains that different meditations have different effects, and that meditation can lead to nondual or transcendental experiences, a sense of self-awareness without content. However, after a search of the scientific literature he reported that physiological measures and first-person descriptions of transcendental experiences and higher states have only been investigated during practice of the Transcendental Meditation® (TM) technique. TM is an effortless technique for automatic self-transcending, different from the other categories of meditation — focused attention or open monitoring. It allows the mind to settle inward beyond thought to experience the source of thought — pure awareness or Transcendental Consciousness. This is the most silent and peaceful level of consciousness — one’s innermost Self. 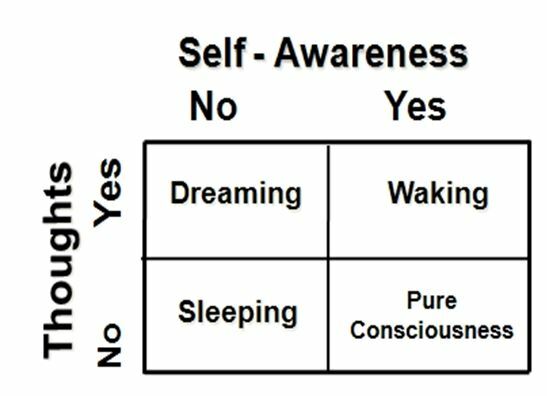 This figure, a 2 X 2 table, compares subjective and objective experiences during waking, sleeping, dreaming, and pure consciousness. As seen in this table, waking state contains a sense of self and mental content — thoughts and perceptions. In contrast, during pure consciousness (Transcendental Consciousness), there is only Self-awareness, without any sense of time, space, and body awareness. Dr. Travis discusses a study of descriptions of Transcendental Consciousness from 52 subjects practicing the Transcendental Meditation technique and found that they experienced “a state where thinking, feeling, and individual intention were missing, but Self-awareness remained.” A systematic analysis of their experiences revealed three themes: absence of time, space, and body sense. Specific physiological changes are associated with this subjective experience of Transcendental Consciousness. These include changes in breath rate, skin conductance, and EEG patterns. Dr. Travis further explains that with regular meditation, experiences of Transcendental Consciousness begin to co-exist with sleeping, dreaming, and even while one is awake. This state is called Cosmic Consciousness, in the Vedic tradition. The paper presents first-person accounts followed by an overview of the physiological patterns associated with Cosmic Consciousness. Whereas control subjects describe themselves in relation to concrete cognitive and behavioral processes, those experiencing Cosmic Consciousness describe themselves in terms of a continuum of inner self-awareness that underlies their thoughts, feelings, and actions. In addition, the Cosmic Consciousness subjects showed the EEG patterns seen during Transcendental Consciousness along with the EEG patterns when they were asleep, and during waking tasks. This leads to higher scores on the Brain Integration Scale developed by Dr. Travis. Dr. Travis suggests that such higher states of consciousness can be seen as normal developments beyond the classic stages described by Piaget. One simply needs a technique to experience transcendence and thereby facilitate the development of these states. The practical benefit of higher states, he says, is that you become more anchored to your inner Self, and therefore less likely to be overwhelmed by the vicissitudes of daily life. The Annals of the New York Academy of Sciences is the oldest continuously published scientific serial in the United States and among the most cited of multidisciplinary scientific serials worldwide. Established in 1823, the Annals is the premier publication of the Academy, offering volumes of review articles in special topical areas and proceedings of conferences sponsored by the Academy as well as other scientific organizations. You can find out more about them here: http://www.nyas.org/whatwedo/publications/annals.aspx. Read the Foreword to Advances in Meditation Research: Neuroscience and Clinical Applications, by editor Sonia Sequeira. Medical News Today: Overview of research on individuals experiencing higher states of consciousness during transcendental meditation. A PDF of the study is now available at ResearchGate. The statement “You are God” seems an absurd and presumptuous blasphemy, so it needs to be clarified. According to pantheism, it’s not just you who are God; all of us are God. And it’s not just all of us who are God; everything is God. God is the universe in synergy, the whole that is more than the sum of its parts. This contradicts mainstream Western theology, which is based on a split between creator and creature. According to this view, God made the universe with us in it and is now observing our behavior, rewarding us or punishing us based on our obedience to His rules. The religions of the East and the mystic tradition of the West have a different view. They feel that God became the universe, manifested it, is it. Rather than observing the universe, God lives it. The universe is God’s active side, engaged in time, space, and matter. God is more than the universe, but there is nothing in it that isn’t God. But if it’s true that we are God, why are we in such an ungodly mess? Because our unity with God is a living reality only in a higher state of consciousness. Reality, as Maharishi Mahesh Yogi said, is different in different states of consciousness. Ordinarily we experience three state of consciousness: deep sleep, dreaming, or waking. Each has its own reality with distinctive physiological parameters of brain waves, blood chemistry, and metabolic rate. Waking state is the realm of duality. We are bound in the relativity of time, space, and matter, so we perceive separations between ourselves and others. In waking state the idea that we are God is nonsensical. It contradicts our perceptions. But it’s possible to experience a fourth state of consciousness that has its own reality and physiology. It’s called transcendental consciousness because it’s beyond the other three, existing at a more fundamental level. Here the duality and materiality of waking state are only surface conditions. The deeper underlying reality is unity, where the separations fade and everything, including matter, is experienced as one unified field of consciousness. Here your individual thinking mind merges with the mind of God. You’re no longer just a part of God. You transcend the boundaries of your small self and expand into the one great Self, the divine spirit animating the universe. All separations between you and God disappear, and you become One. In transcendental consciousness you really are God and you really are experiencing a sacred life. The most effective method I’ve found for achieving this state on a regular basis is Transcendental Meditation. But even with TM, it’s usually a fleeting experience. In transcendental consciousness the mind is without thoughts. It reaches the source of thought, where it becomes pure Being — alert and aware but without an object of awareness, consciousness experiencing itself. This state is so blissful, so all-encompassing, so divine, that we think, How wonderful! And as soon as we have that thought, we’re no longer there. But as we come out, we bring some of the energy, intelligence, and joy of this unified field back into our waking state of consciousness, where it enriches our life. And ironically, one of the ways it enriches it is by giving us a deeper appreciation of our separateness from God. The sense of separation we experience in waking state is a great aid to devotion. It’s easier to love something external to us, even if this externality is only partially true. Each experience of transcendental consciousness also heals our nervous system of stresses we’ve accumulated in the past. It is these stresses, or karma, that make our mind unable to stay in that state while we’re thinking and acting. Once those stresses are gone, which usually takes many years, our mind and body function in that state permanently. This is enlightenment, the height of human development in which our unity with God is a living reality, not just a concept. In this state we live the sacred life 24/7. 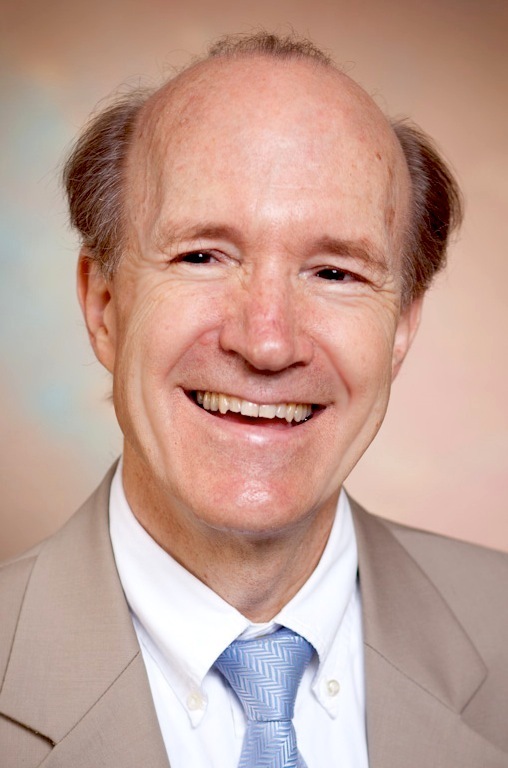 William T. Hathaway is a peace activist, award-winning author, and adjunct professor of American studies at the University of Oldenburg in Germany. His latest novel, Summer Snow, tells of an American warrior in Central Asia who falls in love with a Sufi Muslim and learns from her that higher consciousness is more effective than violence. Chapters are available on a page of the publisher’s website: www.peacewriter.org. Also see Radical Peace: People Refusing War, by William T. Hathaway, later republished on other websites listed at the bottom of the article as Conscious Peace: World Peace Depends upon Our Collective Consciousness. Here’s a related article God? ~ Dr. Evan Finkelstein.